The Taxi Grant Scheme to replace vehicles with electric alternatives was launched on Thursday 1 February 2018. 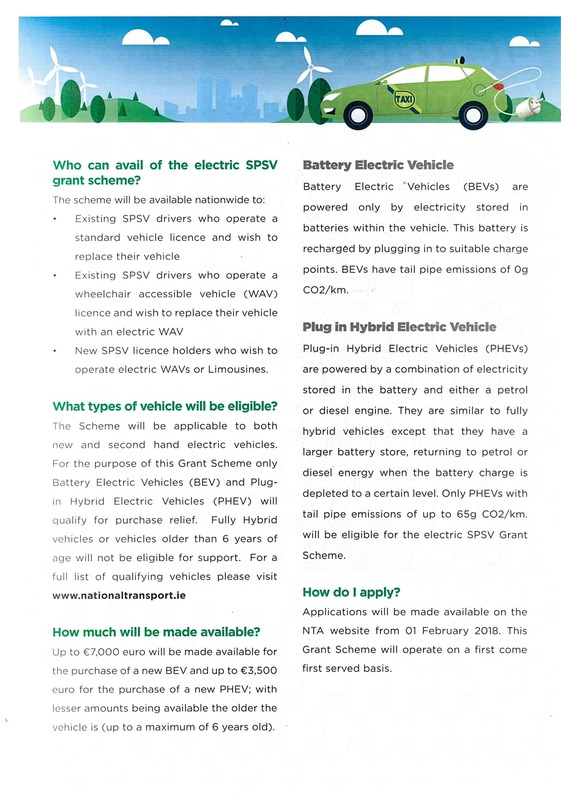 This scheme will be administered by the National Transport Authority and will enable up to €7000 off the purchase price of an electric SPSV (in addition to VRT relief and SEAI grant scheme) and €3,500 off the purchase of a Plug-In Hybrid Electric SPSV. SPSV Prius PHEV Offer: Toyota will match the Department of Transport’s newly announced grant of €3,500 for plug-in SPSVs with a further €3,500 discount off all Prius Plug-in vehicles registered before 31st July 2018. This discount applies to new cars supplied by Toyota Ireland and registered as a SPSV, only. SPSV Drivers have been driving the Toyota Prius for years, this amazing car is also available as a Plug-In so would be applicable for the SPSV Grant. 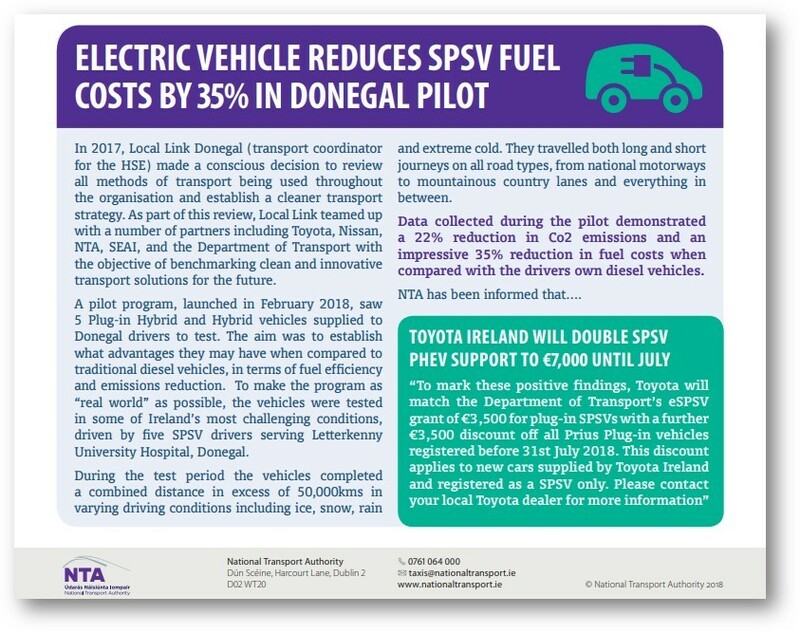 Toyota will match the Department of Transport’s newly announced grant of €3,500 for plug-in SPSVs with a further €3,500 discount off all Prius Plug-in vehicles registered before 31st July 2018. This discount applies to new cars supplied by Toyota Ireland and registered as a SPSV, only. Electric owners will now only pay half the toll rate and plug-in hybrid owners will get a reduction of 25 per cent. In 2017, Local Link Donegal (transport coordinator for the HSE) made a conscious decision to review all methods of transport being used throughout the organisation and establish a cleaner transport strategy. As part of this review, Local Link teamed up with a number of partners including Toyota, SEAI, and the Department of Transport with the objective of benchmarking clean and innovative transport solutions for the future. A pilot program, launched in February 2018, saw Toyota Ireland supply 5 self-charging Hybrid electric and Plug-in Hybrid vehicles for drivers to test. The aim was to establish what advantages they may have when compared to traditional diesel vehicles, in terms of fuel efficiency and emissions reduction. To make the program as “real world” as possible, the vehicles were tested in some of Ireland’s most challenging conditions, driven by five taxi drivers serving Letterkenny University Hospital, Donegal. During the test period the vehicles completed a combined distance in excess of 50,000kms in varying driving conditions including ice, snow, rain and extreme cold. They travelled both long and short journeys on all road types, from national motorways to mountainous country lanes and everything in between. Data collected during the pilot has demonstrated a 22% reduction in Co2 emissions and an impressive 35% reduction in fuel costs when compared with the drivers own diesel vehicles. Impressive results. · The electric SPSV grant scheme can also be used in conjunction with the NTA’s ‘Wheelchair Accessible Vehicle’ grant scheme which is also open to applicants from 1 February 2018. Analysis shows that fuel savings of up to 10 cent per km can be achieved by driving an electric vehicle in comparison to a conventionally fuelled vehicle. For a vehicle clocking up to 55,000km per annum, this would equate to fuel savings of over €5,000 and net reduction in over 3.5 tonnes of CO2 emissions. The ACA is a tax incentive for companies paying corporation tax and aims to encourage investment in energy efficient equipment. The ACA offers an attractive incentive whereby it allows companies to write off 100% of the purchase value of qualifying energy efficient equipment against their profit in the year of purchase. The ACA is claimed on the company’s return of income (form CT1). Since 2009 there is a separate entry field for ACA alongside the standard capital allowances entry field. The ACA can be claimed for the accounting period in which the equipment was first provided and used for its trade, provided that the equipment is included on the published list at some stage during that accounting period. Apart from the acceleration of the allowances to 100% in year one, the ACA is subject to the same rules as are applied to the standard wear and tear allowances for plant and machinery. There is no requirement to obtain approval for expenditure on the energy-efficient equipment. The normal self-assessment tax provisions apply. Note: this category is included in the scheme as part of the strategy to promote greater usage of low-emissions vehicles. Section 37 of the Finance (No. 2) Act, 2008 inserted a new subsection 8A into section 285A. 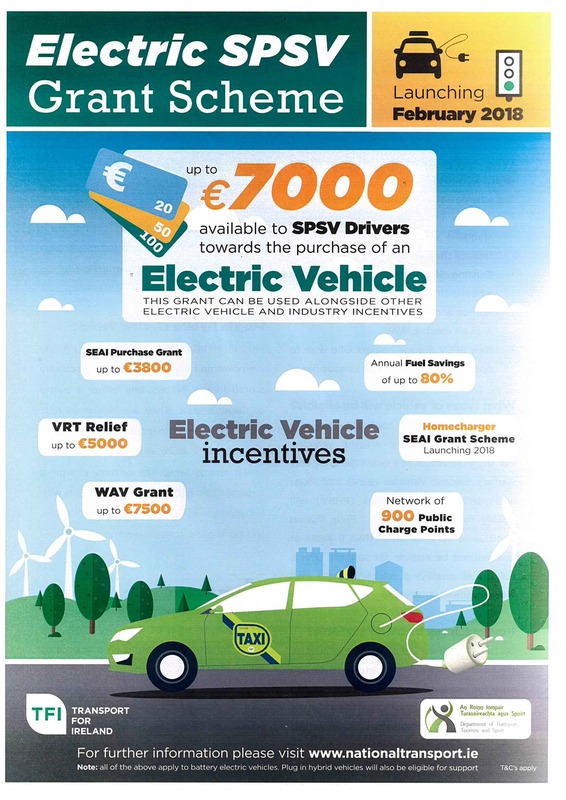 The new subsection, ensures that in the case of cars coming under the category “Electric and Alternative Fuel Vehicles” the accelerated allowance is based on the lower of the actual cost of the vehicle or the specified amount of €24,000 referred to in section 380K(4) TCA, 1997. The emissions-based scheme in Part 11C TCA will not apply where a company opts to avail of accelerated capital allowances under section 285A. The converse also applies so that a company can opt for one scheme or the other, but not both, insofar as business cars are concerned. For electric or alternative fuel cars, a company may opt for the accelerated allowance scheme for energy efficient equipment under section 285A or the existing emissions based scheme of allowances under Part 11C. The latter scheme, which was introduced in the Finance Act 2008, is based on the emissions levels of cars. Under this scheme an allowance is available at 12.5% over a period of 8 years and up to a “specified amount” of €24,000 regardless of the actual cost of the car. For example, an allowance of €24,000 will be available even where the actual cost of the car is lower. Imagine being able to drive at speeds as high as 135km/h or as far as 50km* without using a drop of fuel. Well, that time is now thanks to the Prius Plug-in Hybrid’s 68kW EV power rating. When your journeys exceed its 50km* EV range the new Prius Plug-in Hybrid is estimated to sip fuel at 282 MPG*, which means fewer refuels for you and even fewer emissions from the tailpipe: estimated at an exceptionally low 22g/km*.